While ABC prepare for a potential large audience to tune in this weekend hoping to discover who won the honours in the 48th edition of the prestigious ‘Oscars’, event organisers may be preventing one of the biggest talking points from occurring, as actor Sacha Baron Cohen has been threatened with dis-invitation to the popular awards ceremony. The comedian and filmmaker, best known for his roles in ‘mockumentary’ characters and films such as Ali G, Borat, and Bruno, is said to have recently suggested to the Academy (who organise the Academy Awards) that his appearance at the event (invited as an Academy member and cast member of multiple-nominated film Hugo) could be used as promotion for his upcoming comedy film/mockumentary The Dictator, where he would walk the red carpet dressed as his fictional character ‘General Aladeen’, who the movie blurb claims ‘risked his life to ensure that democracy would never come to the country he so lovingly oppressed’. While he claimed that he would change into a tuxedo (the more traditional ‘Oscars’ dress code) before he took his seat inside the Kodiak Theatre in Los Angeles (USA), his request has been denied, with organisers stating that he is still allowed to come, but only in regular attire, although Paramount Pictures (the studio behind The Dictator) believe that it is effectively a ban on the controversial Baron Cohen appearing on Sunday. 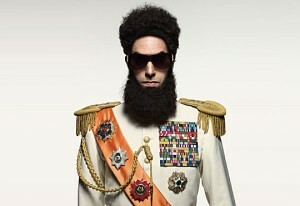 It is believed that Sacha Baron Cohen’s ticket of entry has been ‘suspended’ for the time being, and will only be given back to the English star on the condition that he promises the organisers that he will show up ‘un-costumed’, and under no promotional stunts, though it is believed that Baron Cohen (who did not appear at the 2007 event for similar reasons relating to his character Borat), has so far refused to agree to the terms. While it looks likely that the actor will be formally uninvited from this year’s event for fairly incomprehensible reasons (not being allowed to ‘entertain’ at a show which celebrates the entertainment industry), what is the betting that ‘General Aladeen’ will be in Los Angeles on Sunday anyway? Was Twitter to Blame For Bruno Losing Millions?